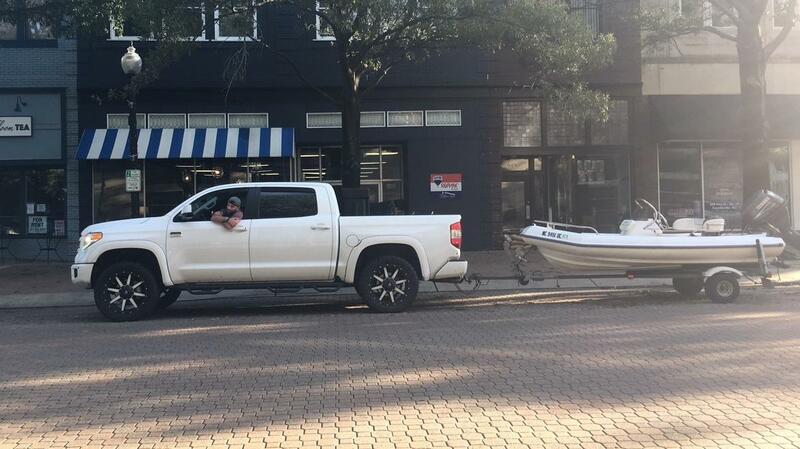 John Gallagher in his truck in Fayetteville, N.C. "We've just been taking dispatch calls for swift water rescues, rescuing animals, missing persons," Gallagher said. Taylor Fontenot from Sugarland Texas said he's helped save hundreds of people since Hurricane Harvey last year. He thinks volunteers can be more efficient than the government. This week while visiting eastern North Carolina, President Trump thanked the first responders who sometimes risk their own lives to help, mentioning traditional government officials like police officers and firefighters – and "our great Cajun Navy." That group is one of several volunteer organizations who've stepped in during recent storms to fill what they see as a gap in the services available from government agencies. John Gallagher, a contractor from Charlotte, N.C., sat dozing in his truck earlier this week. It was parked on the street in Fayetteville's quiet, boarded-up downtown, as the central North Carolina city was waiting for the Cape Fear River that runs through town to finish rising. "We've just been taking dispatch calls for swift water rescues, rescuing animals, missing persons," Gallagher said, showing us his smartphone, where he was receiving emergency calls and other updates through an unofficial social media app. Gallagher said the Cajun Navy — which has several local chapters, and works with multiple similar, loosely-organized groups – works independently from government entities like the Federal Emergency Management Agency, the U.S. Coast Guard, or local police and fire departments. "Totally separate," he said. "It is a true volunteer effort." Across town at a shopping mall, several volunteer rescue groups had set up a temporary staging center for their boats, pickup trucks, and trailers. Sherry Fox and some friends were listening to dispatch calls on a smartphone, waiting to be sent out on a rescue by a self-styled volunteer dispatcher. Several emergency managers reached by NPR said volunteers should go through official channels – both to make sure that they're safe, and so that calls for help don't fall through the cracks. Fox, who lives in Belmont, N.C., near the South Carolina border, said she has training in first aid and experience on the water. She said the government agencies can't do everything that needs to be done in a crisis. "There's not enough first responders with this massive damage. There's no way. Nobody has this many boats," Fox said. That's a common sentiment among these volunteers, who describe the system as broken or, at best, inadequate. Taylor Fontenot, 29, a roofing contractor from Sugarland, Texas, said he's helped save hundreds of people since Hurricane Harvey last year. He thinks volunteers can be more efficient than the government. "I spent four hours the first night of the storm, in the hurricane, pulling people out of attics," he said. "Seven to 12-member families. I did 153 in three hours." Fontenot was standing barefoot in the ad-hoc command center set up in the mall food court with a handful of laptops and other gear. He started with the Cajun Navy and said he's now setting up a group of his own. North Carolina is an open-carry state, and outside, several young men were milling around with pistols on their hips, waiting for instructions. Fontenot said that while volunteers need protection in tense situations, he's seen that go too far. "We had that happen here, they came in with Texas plates, they were open carrying, carrying around assault rifles for no reason," he said. Needed help, or a liability? Emergency responders say they sometimes work with good Samaritans, but worry that volunteers are jumping in without proper training. Coast Guard Spokeswoman Amanda Faulkner said agencies like hers have plenty of boats – and know when it's safe to take them out on the water. "At what point do you become a liability? And when do you create an unsafe situation where you are putting your life at risk and a first responder has to come out and help you?" But Gallagher, the contractor from Charlotte, said of course the Cajun Navy is doing dangerous things – that's the point. "Because we're not under command, we don't have to ask; we don't have to wait," he said. "We just go. Even when it's too dangerous we still go." Despite the volunteers' zeal and the president's praise for the Cajun Navy, a spokesperson with FEMA said in a statement that the agency "strongly discourages" people from showing up to disasters on their own. During hurricanes like Florence, many people find themselves trapped and needing rescue. This week, while he visited eastern North Carolina, President Trump thanked the first responders who sometimes risk their own lives to help. PRESIDENT DONALD TRUMP: Sheriffs, police officers, firefighters, our great Cajun Navy - they're all over the place. SIMON: That last group, the Cajun Navy, is one of several volunteer organizations who've stepped in during recent storms to try to fill what they see as a gap in the services available from government agencies. As NPR's Sarah McCammon reports, they have a complicated relationship with the official first responders. SARAH MCCAMMON, BYLINE: When we met John Gallagher on a cloudy morning early this week, he'd been dozing off in the front of his truck parked on the street in Fayetteville, N.C.'s quiet, boarded up downtown. The city was waiting for the Cape Fear River to finish rising and Gallagher, a contractor from Charlotte, was waiting for a call for help. JOHN GALLAGHER: We've just been taking dispatch calls for swift water rescues, rescuing animals, missing persons. MCCAMMON: Gallagher is with the Cajun Navy, a loosely organized group - or really, several groups - that have sprung up in recent years in response to hurricanes like Harvey and now Florence. He says they work independently from government agencies like FEMA or the Coast Guard or local police and fire departments. GALLAGHER: Totally separate - it is a true volunteer effort. MCCAMMON: Across town at a shopping mall, several volunteer rescue groups had set up an ad hoc staging center for their boats, pickup trucks and trailers. UNIDENTIFIED PERSON: They have, like, all these emergency vehicles set up and stuff. MCCAMMON: Sherry Fox and some friends who had driven up from near the South Carolina border were listening to dispatch calls on an unofficial social media app, waiting to be sent out on a rescue. Several emergency managers reached by NPR said volunteers should go through official channels, both to make sure that they are safe and so that calls for help don't fall through the cracks. But Fox, who says she has training in first aid and experience on the water, says the government agencies can't do everything. SHERRY FOX: Because there's not enough first responders with this massive damage and this - there's no way, nobody has this many boats. MCCAMMON: That's a common sentiment among these volunteers. 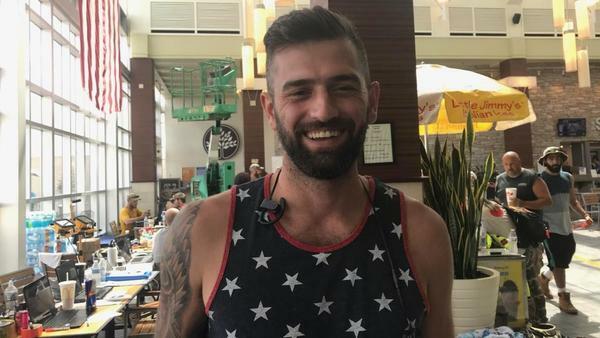 Taylor Fontenot, a 29-year-old roofing contractor from Sugarland, Texas, says he has helped save hundreds of people since Hurricane Harvey last year. He thinks volunteers can be more efficient than the government. TAYLOR FONTENOT: I spent the four hours the first night of the storm during - in the hurricane, pulling people out of attics, seven to 12-member families out of attics. I did 153 in three hours. MCCAMMON: Fontenot was standing barefoot in an ad hoc command center set up in the mall food court with a handful of laptops and other gear. He started with the Cajun Navy, and now he's setting up a group of his own. North Carolina is an open-carry state, and outside, several young men were milling around with pistols on their hips, waiting for instructions. Fontenot says volunteers need protection in tense situations, but he says he's seen that go too far. FONTENOT: We had that happen here. They came here on Texas plates. They're open carrying, carrying around assault rifles for no reason. MCCAMMON: Emergency responders say they sometimes work with good Samaritans but worry that volunteers are jumping into these situations without proper training. Coast Guard spokeswoman Amanda Faulkner says agencies like hers have plenty of boats and know when it's safe to take them out on the water. AMANDA FAULKNER: At what point do you become a liability? And when do you create an unsafe situation where you are putting your life at risk and a first responder has to come out and help you? MCCAMMON: John Gallagher, the contractor from Charlotte, says, of course, the Cajun Navy is doing dangerous things. That's the point. GALLAGHER: Because we're not under command, we don't have to ask, we don't have to wait. We just go. And even when it's too dangerous, we still go. MCCAMMON: Despite the president's praise for the Cajun Navy, a spokesperson with FEMA says the agency strongly discourages people from showing up to disasters on their own. Sarah McCammon, NPR News, Fayetteville, N.C. Transcript provided by NPR, Copyright NPR.